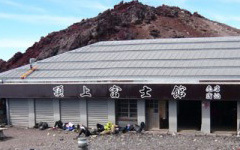 Fujikan is located at the top of Mt.Fuji on fujinomiya trail. Then Fujikan is the right place for you. 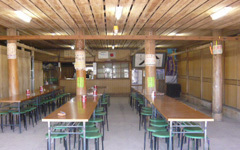 Food and drinks are available in our large cafeteria. Menu：Noodles，Wonton Soup，Hot Milk Tea，Hot Coffee，and soon. We don‘t sell hot water. but,We do sell water. ■You can see the most beautiful sunrise in front of our hut. 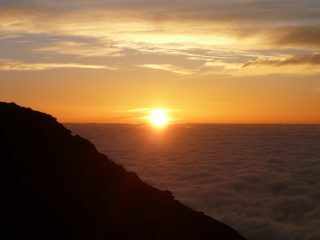 ①You can see the most beautiful sunrise in front of our hut. 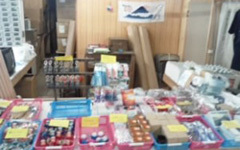 ④There is Sengen Shrine post office next to our hut. ●Our hut is closed from 3p.m.-4p.m. for cleaning. everyone will be provided with a futon in our hut. You must check in between 4pm and 6pm. Our hut is gate will be closed at 7pm. ★We do have blankets. So you don‘t need to bring your blanket. You can check the status of your reservation on our website. Make a reservation online, and get our original Mini Towel for free. adults and children will be charged the same amount. Reservations should be made by Phone, FAX or Email. ←click here for Room Availability. Please write the email title as “summit Fujikan reservation” for spam prevention. ☆the reservation of E-mail is only foreigner.